(Nanowerk News) Physicists at JILA have demonstrated a new tool for controlling ultracold gases and ultracold chemistry: electric fields. As described in the April 29 issue of Nature (Dipolar collisions of polar molecules in the quantum regime), JILA scientists discovered that applying a small electric field spurs a dramatic increase in chemical reactions in their gas of ultracold molecules. JILA is a joint institute of the National Institute of Standards and Technology (NIST) and the University of Colorado at Boulder. The discovery builds on the same JILA research team's recent pioneering observation of how molecules behave in the chilly world near absolute zero, which is governed by the curious rules of submicroscopic quantum physics. In this realm, the molecules act like waves instead of particles, and overlap of the waves determines whether chemical reactions occur to create different molecules. This is a schematic depiction of an energy barrier between polar molecules in an ultracold gas. The fully symmetrical barrier (left) arises only between molecules known as fermions, which if identical cannot occupy the same place at the same time. This barrier greatly reduces the likelihood of chemical reactions. When an electric field is applied to the gas, the barrier is modified (right) so its height varies by direction. Molecules that approach each other parallel to the electric field face a lower barrier and are more likely to react. If molecules approach each other perpendicular to the electric field, then the barrier is raised. In their experiments, researchers study chemical reactions between pairs of ultracold molecules, each consisting of a single potassium (K) atom and a single rubidium (Rb) atom. These KRb molecules are susceptible to electric fields because they are electrically "polar": they have a positive electrical charge at the rubidium end of the molecule and a negative charge at the potassium end. In this latest publication, the researchers measured how electrical fields can control the rate at which these KRb molecules react, discovering how to speed up the reactions or slow them down. Controlling reactions in this way can allow researchers to create molecular products tailored for practical applications. "We want these molecules to survive for a long time in our trap so that we can go on to do other quantum physics experiments, such as quantum simulations and quantum information processing," explains NIST Fellow Jun Ye, a senior author of the new paper. The ability to control reactions may enable scientists to create a novel platform for quantum computing in which ultracold molecules would be manipulated to store and swap information. Scientists also may be able to create novel superfluids—frictionless fluid-like phases of matter—that would feature ultracold molecules instead of the atoms typically used in such studies. Such studies might help scientists better understand superconductivity, the flow of electricity without resistance, or quantum magnetism. "What's new here is the possibility for long-range interactions," says NIST Fellow Deborah Jin, the other senior author of the new paper. 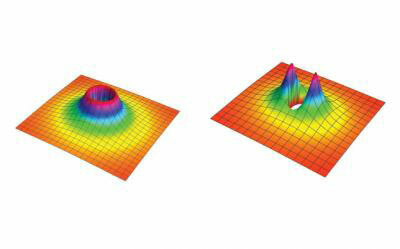 "Basically, atoms interact only by hitting each other—we call this a contact interaction. Polar molecules can interact at a distance, like two magnets attract (or repel) each other even when they are not touching each other." The molecules used in the research are in their lowest possible energy state. The JILA scientists used an external electric field to "tune" the molecules' electrical properties, increasing the chemical reaction rate very rapidly—boosting it 30 fold, for instance, with a fairly small electric field. The ultracold gas of molecules is confined in a three-dimensional, pancake-shaped trap created by two horizontal infrared laser beams. An electric field is applied vertically through the center of the trap. A key finding is that molecules react at different rates depending on their position and orientation in the trap and the angle at which they approach each other. Molecules that approach each other head-to-tail parallel to the applied electric field are more likely to react. Molecules that approach side-by-side perpendicular to the field are less likely to react. The overall net increase in reactions heats the gas, because particles are removed from the center of the trap where molecules are denser and cooler, thus leaving hotter molecules behind. These results suggest that, to suppress reactions and heating and make the molecules last longer for experiments, the trap should be reduced to two spatial dimensions, perhaps into a column of pancake-shaped traps confined by lasers—an "optical lattice" like that used in some next-generation atomic clocks.